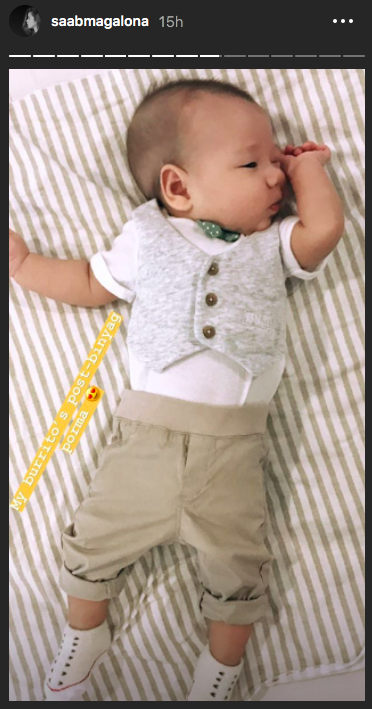 Saab Magalona and Jim Bacarro's son Pancho was baptized yesterday, July 14, 2018, at Santa Maria Della Strada Parish in Quezon City. Saab posted on Instagram a family photo from the ceremony and wrote the simple caption "Proud parents." But before the ceremony, Saab recounted a touching moment with her son when he was just born. She wrote down her thoughts on another Instagram post. It can be recalled that Saab once shared a heartbreaking story about losing Pancho's female twin Luna, staying at the intensive care unit for two months, and Pancho's critical condition after he was born. Saab's post began by revealing that she underwent an emergency C-section at 30 weeks and six days into her pregnancy, "because our baby girl's heartbeat had stopped. Our baby boy survived but I did not see him for six days because I was in and out of the ICU myself (it's a long story)." Saab shared that during the time, all she could do was to ask Jim for photos and videos of Pancho. She was also always thinking about losing their daughter, which kept her in constant pain. Saab added, "Honestly, at the time, I just kept thinking our baby boy would not make it either, especially with the initial tests they did on him. It was Valentine's Day when I was finally cleared to visit him and I cried. I was so happy but I was also so scared. I washed my face, put on some lip and cheek tint, and brushed my hair. It was like a first date and I wanted to look pretty for my son. As I saw his sweet tiny body on his bed, barely moving, I was overjoyed. Jim told me he wasn't moving at all during the first few days, so his tiny movements were more than enough for us. It dawned on me that aside from [being] Valentine's Day, it was also Ash Wednesday, the first day of Lent. Somehow, I felt God was telling me to keep praying and not to lose faith." As she ended her message, Saab took a moment to remember Luna and how far her family has come since those "dark days." She wrote, "I know Luna will also be with us as we celebrate this milestone." The baptism ceremony was truly a happy day for the family. Saab's sister, Unna Fernando-Lu, posted on her Instagram account photos from the celebration. Check them out! 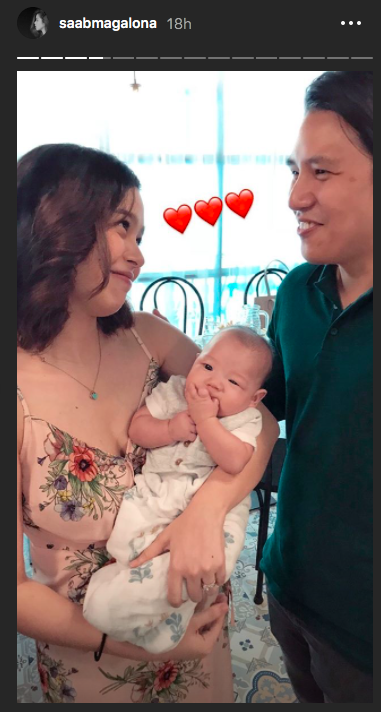 Saab also filled her Instagram stories with photos from the happy day. We are loving this family photo! Jim's parents are over the moon too. Who wouldn't be? 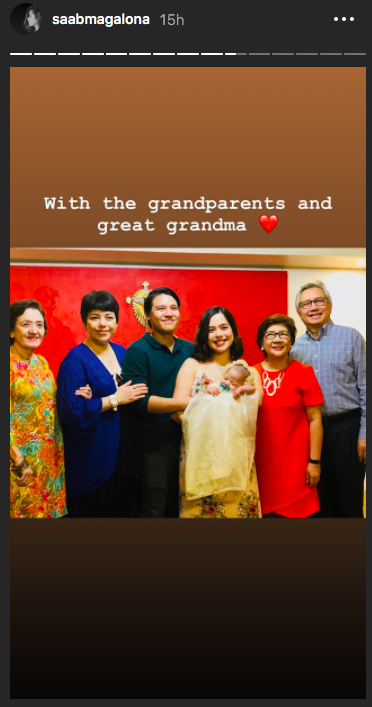 It's hard not to smile after seeing this family photo with the grandparents and Saab's great-grandmother. Finally, this post-binyag outfit is everything!